How cute is that bunny?! 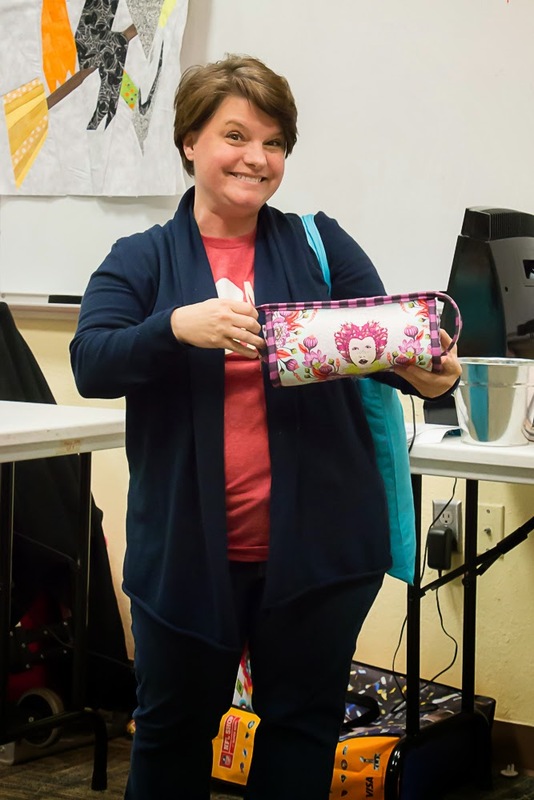 So, take a look at Shannon's blog, and see if it's something you'd be interested in our Guild pursuing. Members can vote "yea" or "nay" on the Guild's private Facebook page. The "Road to Oklahoma" block lottery project was also announced. You can find details in the April newsletter , by clicking on the corresponding graphic on the right, or by simply clicking here. Leslie announced a possibly opportunity for our guild to showcase at the Oklahoma City Museum of Art in October. We won't know anything for certain until this summer, but in the meantime be thinking about ideas for quilts to display similar in size to our previous October "Defining Modern" show (54" x 70"). Leslie is challenging us to create using an Alternate Gridwork design. More details and specifications to come as Leslie learns them. 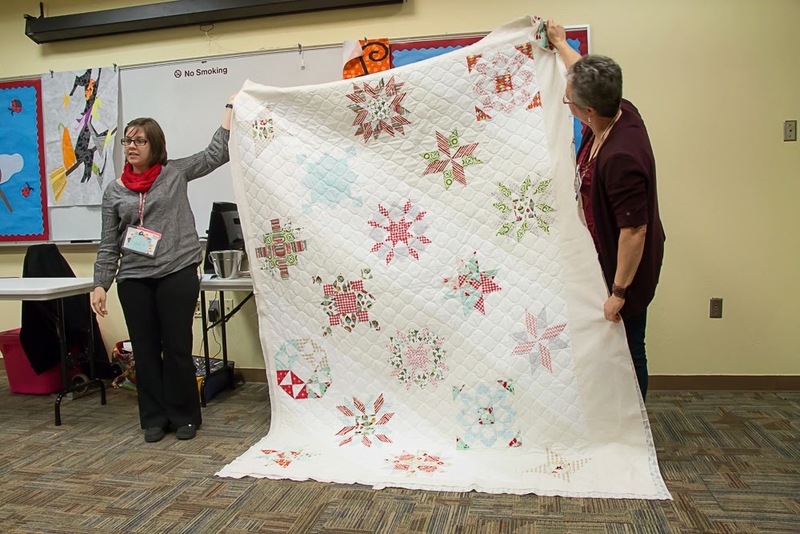 OKCMQG member, and paper piecing maven, Angie Bullard spoke with the guild about designing paper piecing patterns and offered some tips and tricks on paper piecing assembly. 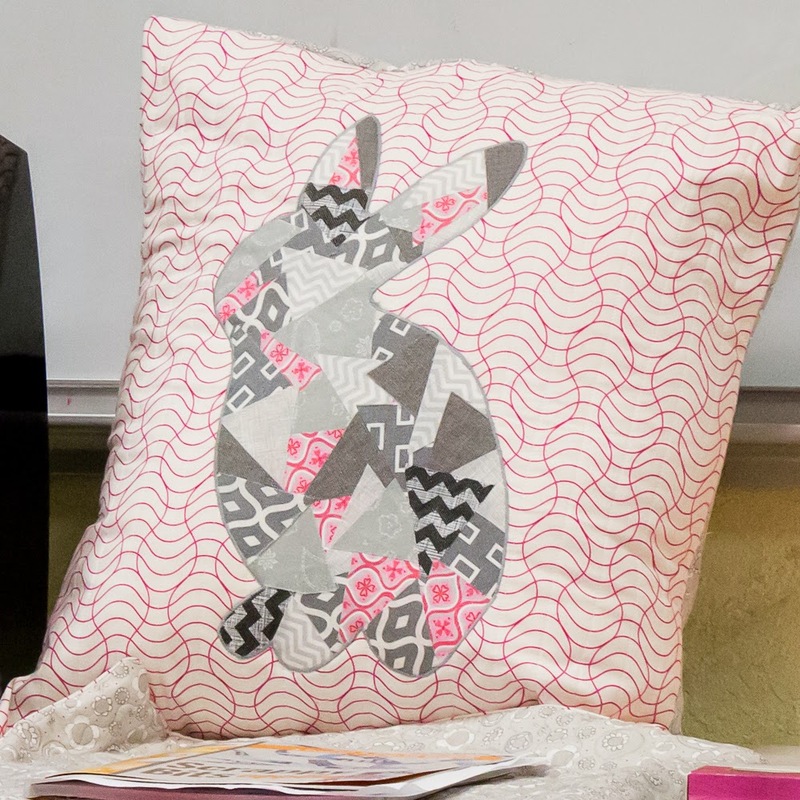 Her patterns are super cute, and are available on her Craftsy page. 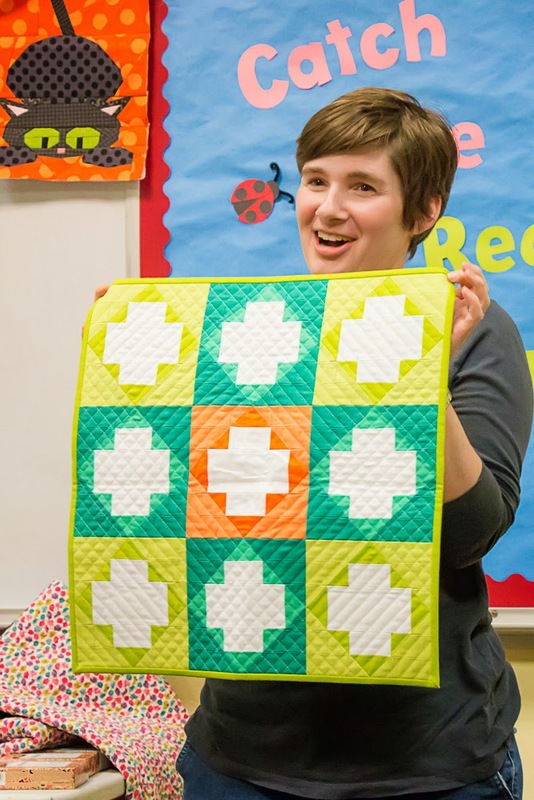 She brought several of her finished blocks along, and has this darling umbrella pattern available for download for the guild on our private Facebook page, so make sure you check that out. And, as usual we had some awesome Show 'n Shares this month. 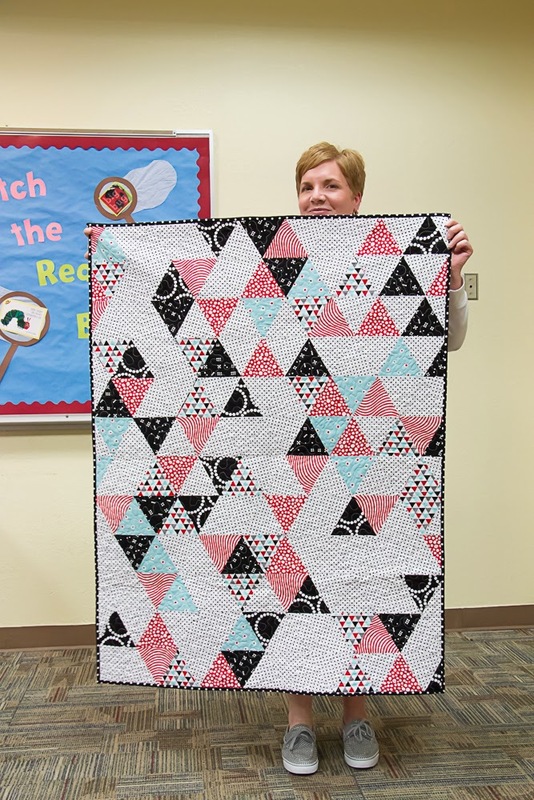 Leslie decided to put that alternate gridwork style to work in this darling triangle quilt she made for her cousin's baby. 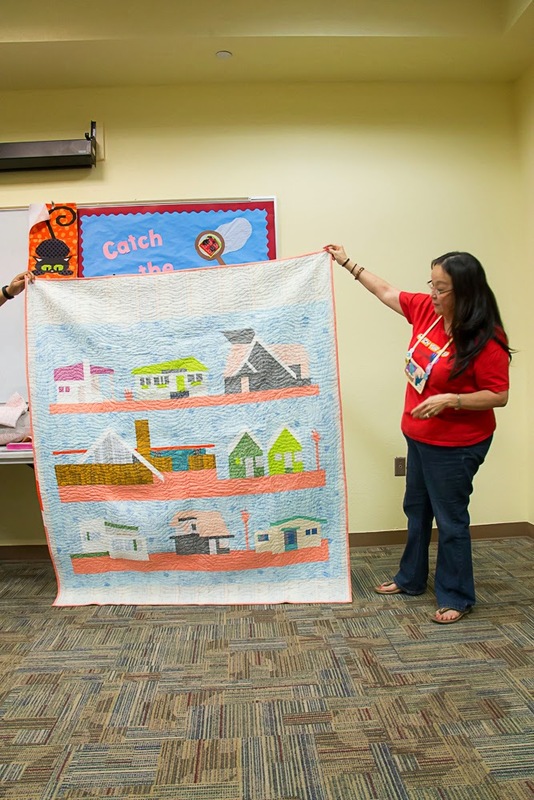 Agnes made this bandana quilt for her husband and the top only cost something like $19! Note to self...buy some bandanas! 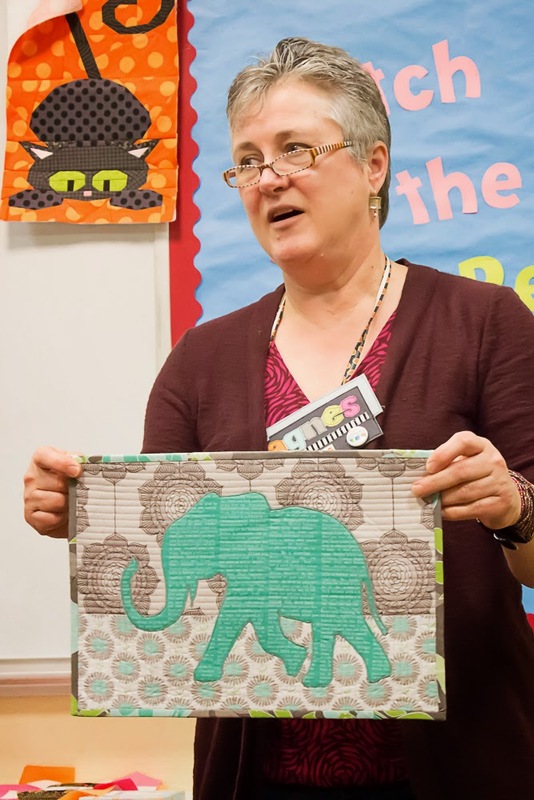 She also brought along this little elephant mini she made using the Riley Blake MQG Challenge fabric. 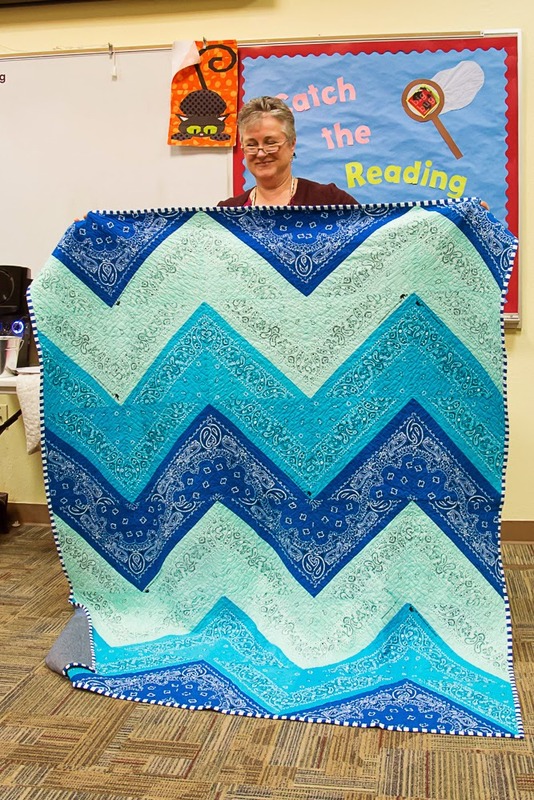 Phoebe showed off this gorgeous raffle quilt that she designed and quilted for the Central Oklahoma Quilters Guild. Diane played with her new long arm (WOO!) on this sweet quilt made using V and Co fabrics. We think she did a great job with that new long arm! 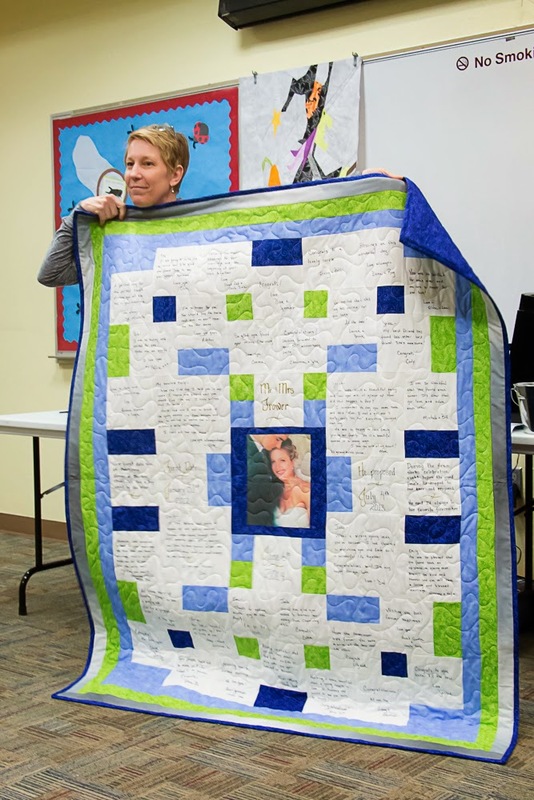 Trish is helping dreams come true by helping the DIY generation create unique quilty guest books for their life events. Traditional guest books are so last season dontcha know. 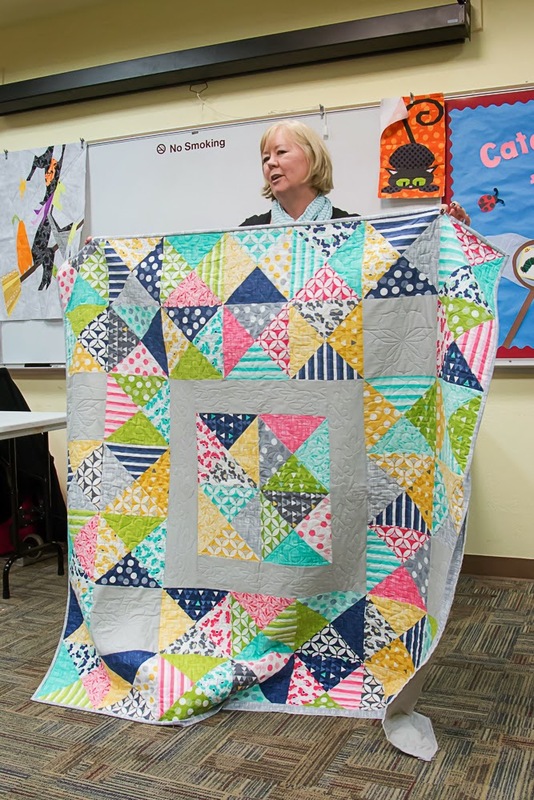 Jana quilted this lovely charm pack quilt up using some of the techniques she learned a class she took in Dallas. Elizabeth got a steal on some Christmas fabrics and decided to use them to make a star quilt (her favorite kinds of blocks). 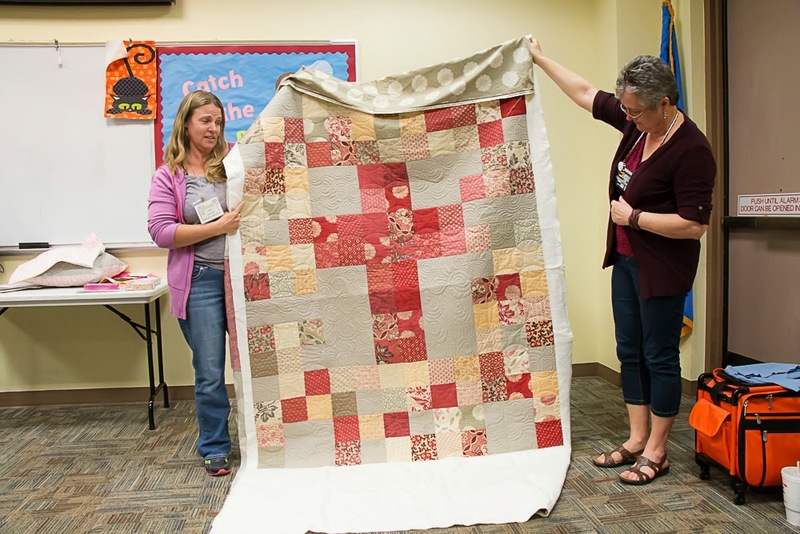 Beautiful, and the lovely all over quilting was done by Jana too. Vicki brought in a friend's quilt to share as she's always amazed by the way in which he uses the fabrics he buys. 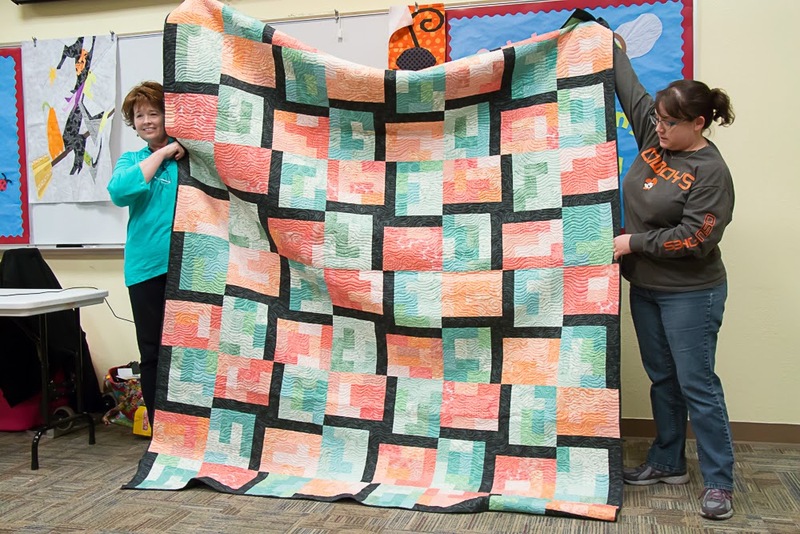 And he's a generous soul as well, as he sends his quilts to the Norman Guild to donate. Melissa shared her gorgeous "Elizabeth" Sew Together Bag. 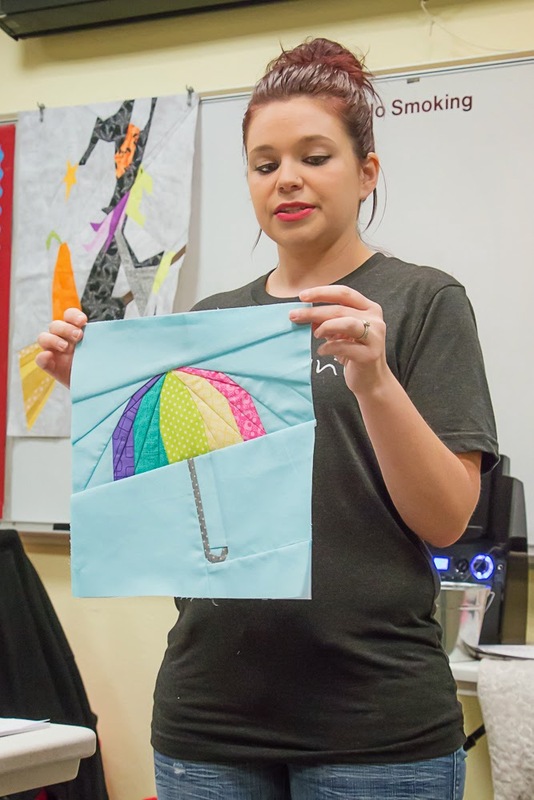 She will be teaching a class on this bag at Oklahoma Quiltworks this summer so make sure you check out their schedule so you too can learn how to make this handy little bag. 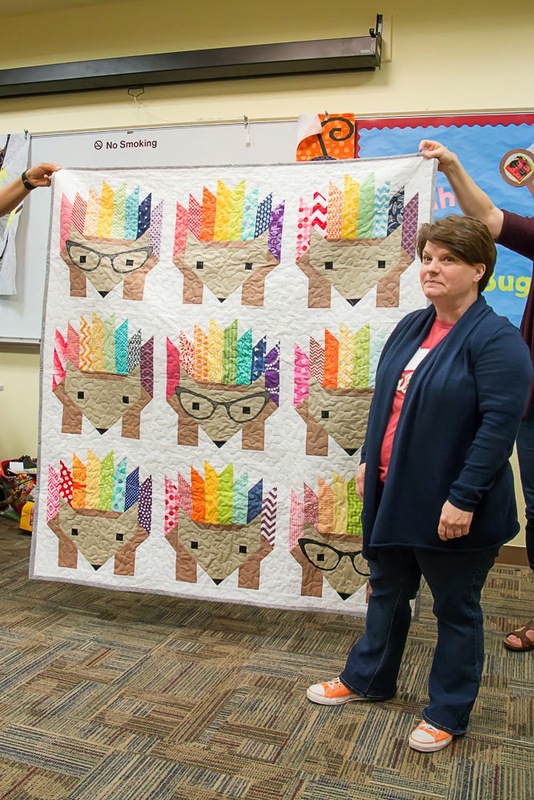 She also finished this custom order Hazel the Hedgehog quilt in a fun rainbow of color. 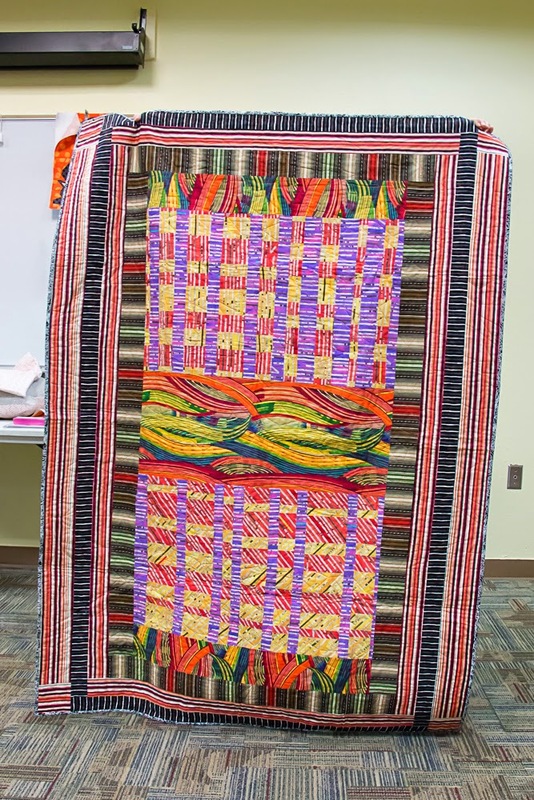 Ann shared her take on Carolyn Friedlander's "Local" quilt pattern. She kicked it up a notch by swapping out a few of the blocks in the pattern for a take she created of her own home. She also joked that it's taken her so long to complete this project that she's been able to use a little bit of each of Carolyn's fabric lines. I shared this little mini quilt, entitled "Copper Boom!," for which I designed a tutorial for FWFS's Mini Quilt Mania series. And there you have it folks! Another fun filled OKCMQG meeting! We look forward to seeing you at the next meeting on May 11th. Until then...happy quilting! I have been enjoying a scroll through your posts this morning. You ladies are amazing! I was tickled to come across this picture of Hazel Hedgehog. I was wondering how she would look made from different colors just yesterday...and there she is in all her glory! Love it, love your blog!